MW: ~18kDa (non-glycosylated), ~28kDa (glycosylated) (SDS-PAGE). Source: Produced in HEK 293 cells. The extracellular domain of human RANKL (aa 152-317) is fused at the N-terminus to a linker peptide (6 aa) and a FLAG®-tag. Specificity: Binds to human and mouse RANK. Application Notes: ELISA: binds to RANK receptor. Scientific Background: RANK ligand (RANKL), also called TRANCE, OPGL and ODF, is a member of the TNF family that is expressed in activated T cells, lymph nodes and in stromal cell lines. RANKL (TRANCE) interacts with its receptor RANK expressed on mature dendritic cells (DC) and mature osteoclasts, leading to the inhibition of apoptosis, probably through the upregulation of bcl-x. RANKL is, therefore, a useful tool for enhancing DC and osteoclast survival and activity. Osteoprotegerin (OPG, see Prod. No. ALX-522-007) is a potent inhibitor of RANKL. Historical data has shown that the biological activity of RANKL supports the survival of dendritic cells and osteoclasts. Figure 1: Schematic structure of human rhsRANKL (peptide, aa. 151-316). 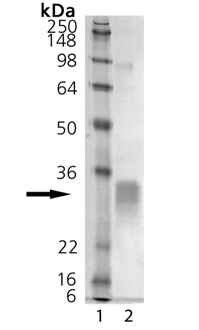 Figure 2: Binding of rhsRANKL to Osteoprotegerin. Recombinant, human sRANKL binds to Osteoprotegerin:Fc (see Prod. No. ALX-522-007).Method: Ligand binding assay: 96 well ELISA plates were coated O/N with 50 ng OPG-Fc (Prod. No. ALX-522-007) per well. After a blocking step, the indicated concentrations of Flag-tagged RANKL were added for 1 hour. Bound ligand was revealed with an anti-FLAG antibody (Prod. No. ALX-804-034) at 1 µ/ml for 30 minutes, followed by a rabbit anti-mouse IgG-HRP at 1/1000 dilution for 30 minutes. OPD was used as a substrate for the peroxidase. Absorbance was measured at 490 nm in an ELISA reader." SDS-PAGE Analysis of RANKL (soluble) (human), (recombinant). Lane 1: MW Marker, Lane 2: 1µg. Figure 3: Mononuclear cells differentiate into Osteoclasts in the presence of M-CSF and RANKL, Soluble (human) (recombinant) (ALX-522-012). Method: Human CD14+ mononuclear cells isolated from adult peripheral blood were cultured in control medium (upper panel), in 25ng/ml M-CSF (middle panel), or in 25ng/ml M-CSF plus 50ng/ml RANKL (lower panel). Osteoclasts were identified as Tartrate-Resistant Acid Phosphatase (TRAP)-positive multinucleated cells. Osteoclasts were detected exclusively in presence of RANKL and in these culture conditions (M-CSF + RANKL), cells fused and generated multinucleated dark red TRAP-positive cells (arrows). Nuclei were stained with haematoxylin. Original magnification: 200x. Picture courtesy of V.Kindler and D.Suvà, University of Geneva."